I had the privilege of attending the wedding of a good pair of pals, and if you remember anything about me, you know that I love a good wedding. Or maybe I’m just obsessed with the beautiful representations captured at a wedding that I can fawn over long after the cake has been cut and the getaway-car has left the scene. Friends Robbie and Melissa were married close to my hometown of McKinney at a breathtaking outdoor venue in Parker, Swingin’ D Ranch. Complete with serene ponds, a twinkle-lit arched bridge, outdoor and indoor reception pavilions, and a large ceremonious gazebo, the lush grounds at Swingin’ D were an absolutely stunning choice for a summer shindig. Check out their website for more examples and pictorials of the venue, as well as how many ways you can dress this ranch up to match your personal taste. Melissa and Robbie chose the vintage, clean look of white milk glass – my ALL TIME favorite, considering how easy (and cheap!) it is to get your hands on these pieces at local flea markets. Just love the mixture of varying sized vases filled with sweet bunches of baby snapdragons, button mums, hydrangeas, and accent daises, to name a few. Always must adore, too, the sweet ambiance of candle votives twinkling on each table, all of which were covered with purple linens and green paisley overlays – a perfect way to make those florals really pop. 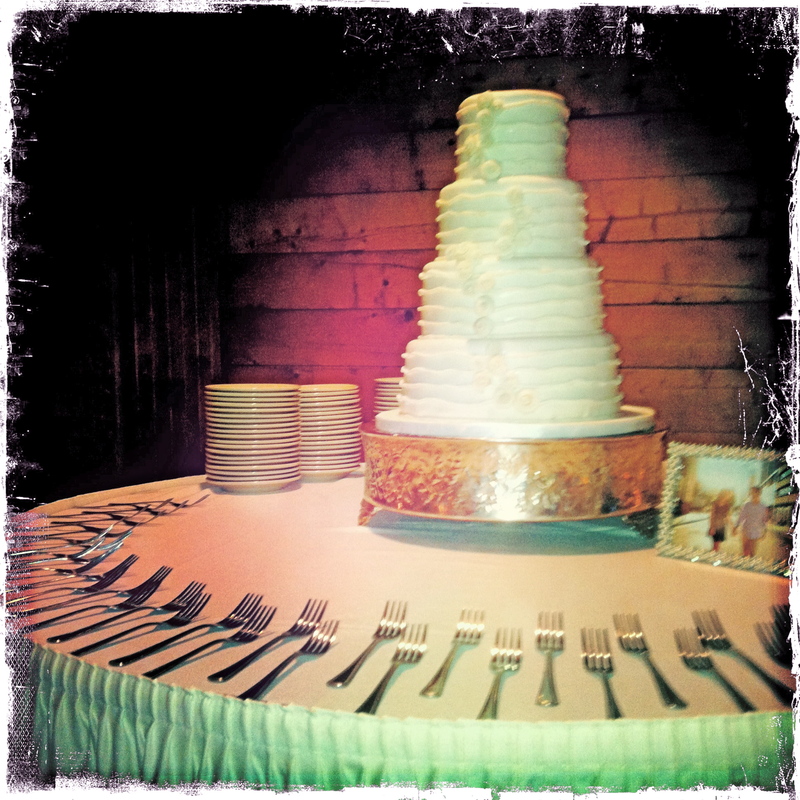 Of course, I had to capture the four tiered wedding cake. Simply white and elegantly textured, it immediately captivated guests from its back corner of the pavilion. The fork arrangement was a cool way to invite cake lovers (me) over to both ogle at and enjoy dessert at their own discretion. I’m a huge fan of worthy DIY ideas, so this chic chalkboard menu immediately caught my attention. 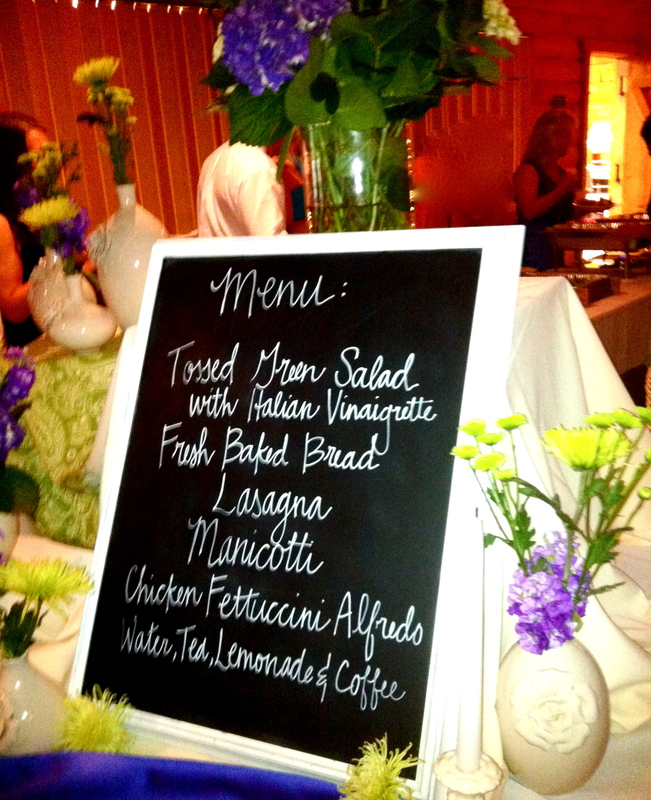 This method offers much liberty in creating your own fun explanation of the dinner that guests can expect upon arrival, plus the cursive handwriting automatically adds personality and homemade love. Although hard to see, also notice the scattered white, decorative vases dressed with more summery florals; incorporating a variety of unique bottles seems to offer that sweet heirloom feel. Finally, here’s a stylish spin on the ol’ guestbook. 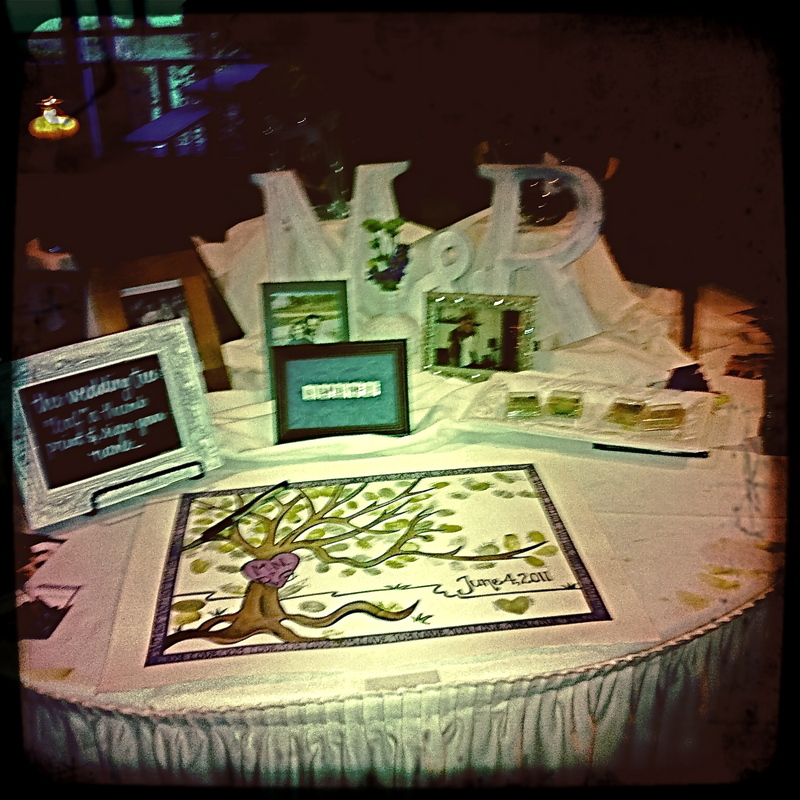 Instead of having everyone sign their names in a book, guests made their presence known by placing a green thumbprint on their “Guest Tree.” By setting out green shaded ink-pads and black fine-tip sharpies, each guest could blot their print upon a branch and sign their names within the mark. 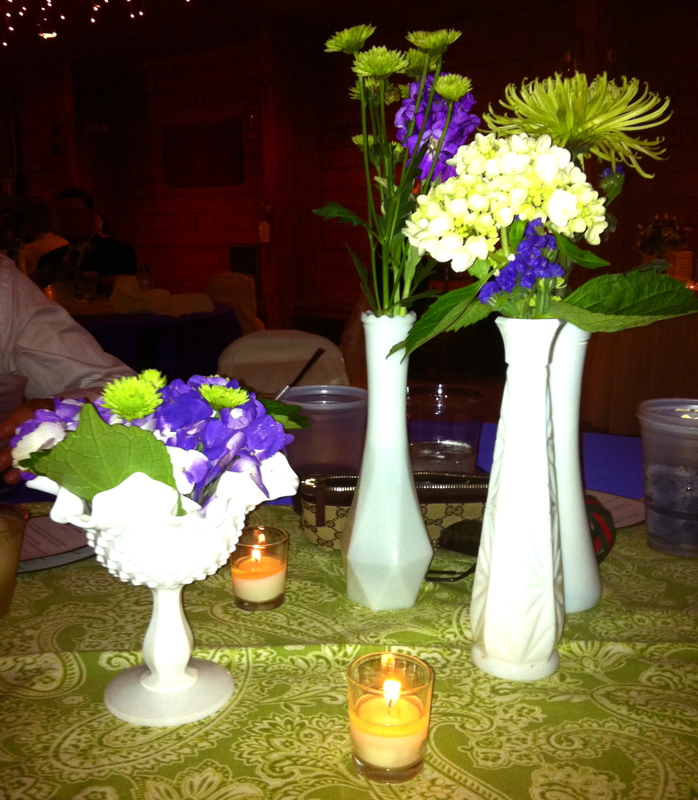 I found this wildly creative and an appropriate way to tie in the outdoorsy venue and natural motifs. We all flocked to participate in this little welcome ritual, while awe-ing over the couple’s wooden initials and the collection of framed photographs. 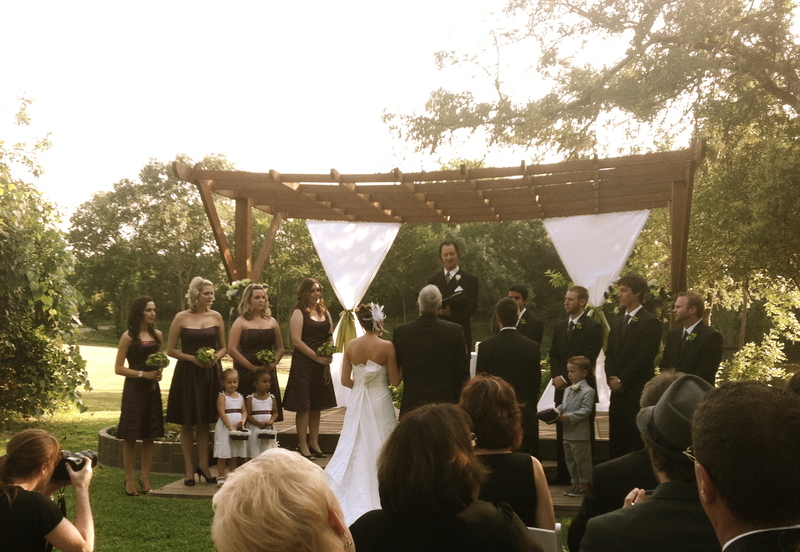 Such a worthy wedding, Robbie and Melissa! So happy to be apart of the special day! I am getting married at Swingin D Ranch in November so I was extremely excited to see these photos. My fiance & I fell in love with this venue the minute we saw it! It looks amazing! Congrats to the happy couple! SO glad you stumbled upon my blog – the venue is amazing and absolutely beautiful! Wishing you guys lots of happiness! !